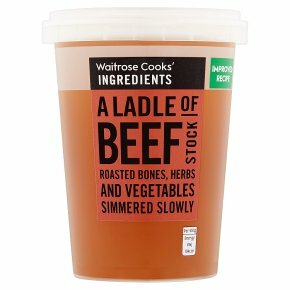 Beef bones, vegetables and herbs have been gently simmered to produce a robust flavoured stock. A beef stock made using roasted beef bones and meat, sourced from our dedicated British beef supplier. INGREDIENTS: beef extract (50%), water, onion extract, carrot extract, tomato purée, ground white pepper, ground bay leaf.